Tire rotations are important for your vehicle. Having a tire rotation means moving them from one wheel to another. This can be from left to right or back to front, or even diagonally. 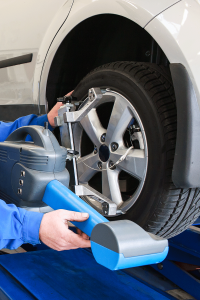 Tire rotation is needed to help keep your vehicle lasting as long as possible. Tires tend to wear unevenly. The tires will wear unevenly based on how you drive and especially how you take corners or curves. Make sure to always check how the tires are wearing for your vehicle. Bad alignment can also caused uneven wear of the tires of your vehicle. If you notice that, bring the vehicle in so we can balance and align them for you. It also extends the life of your tires, saving you time and money in the long run. There are three things that happen during a rotation. First, each tire and wheel is removed from your vehicle and moved to a different position. The air pressure will then be checked. If it is too low or has too much air, it will be adjusted to the recommendation. The brakes can also be checked while the tires are off. Tires tend to wear unevenly. Usually the front tires will wear faster. It is also important you follow the proper rotation and alignment schedule for your vehicle. Not knowing how the tires are wearing, can lead to them failing and needing to be replaced much sooner than it typically should. If you have front wheel drive for your vehicle, rotation is even more important. If you notice any issues with your vehicle, make sure to contact us. By scheduling an appointment we can inspect the vehicle for you. If there is a problem, it is always best to have it resolved as soon as possible.